Cat Crawford just wants to be normal—or at least as normal as a daughter of Hollywood royalty can be. And it looks like fate is granting her wish: she’s got an amazing boyfriend, Lucas; her fabulous cousin, Alessandra, living with her; and her dad planning his second marriage to a great future stepmom. That is, until her prodigal mother reveals on national television that she has something important to tell her daughter…causing a media frenzy. Lucas Capelli knows his fate is to be with Cat, and he’s worked hard to win her over once and for all. Unfortunately, Lucas has his own issues to deal with, including a scandal that could take him away from the first place he’s truly belonged. As secrets are revealed, rumors explode, and the world watches, Cat and Lucas discover it’s not fate they have to fight if they want to stay together…this time, it’s their own insecurities. 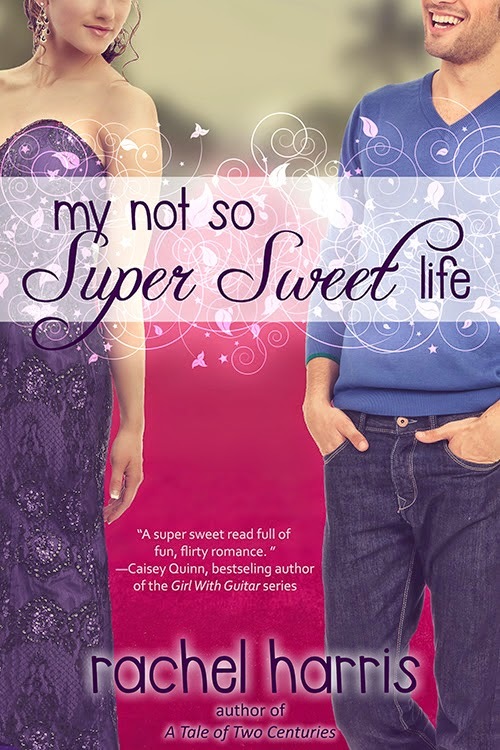 MY NOT SO SUPER SWEET LIFE is a special digital only, fan requested addition to the series! It's also told in DUAL POV. Woohoo! To celebrate the release author Rachel Harris is hosting a giveaway! Rachel Harris writes humorous love stories about sassy girls-next-door and the hot guys that make them swoon. Emotion, vibrant settings, and strong families are a staple in each of her Rachel Harrisbooks…and kissing. Lots of kissing. A Cajun cowgirl now living in Houston, she firmly believes life’s problems can be solved with a hot, sugar-coated beignet or a thick slice of king cake, and that screaming at strangers for cheap, plastic beads is acceptable behavior in certain situations. She homeschools her two beautiful girls and watches way too much Food Network with her amazing husband. An admitted Diet Mountain Dew addict, she gets through each day by laughing at herself, hugging her kids, and losing herself in story. She writes young adult, new adult, and adult romances, and LOVES talking with readers!